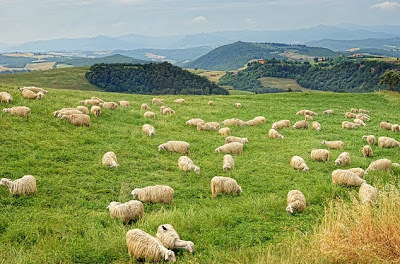 The word for sheep in Italian is pecora - hence the name Pecorino. 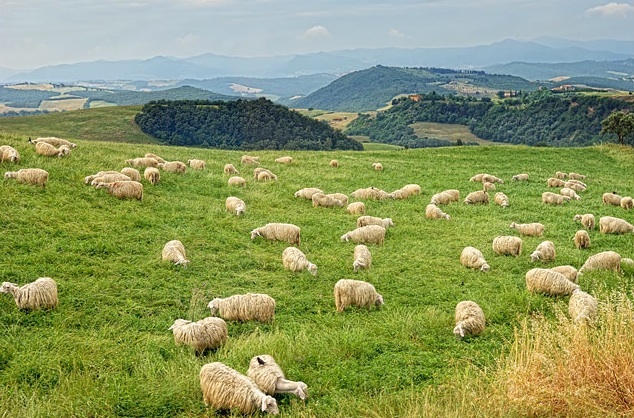 There are many different types of Pecorino produced throughout southern and central Italy where the rugged landscape lends itself to dairy sheep production. 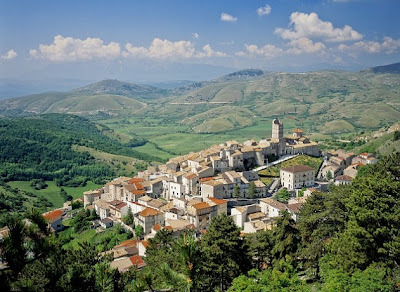 Production is concentrated in the craggy hills of the Maremma, the wild area that extends from Sienna on down to the coast. Although cheeses vary from producer to producer, the characteristics of Pecorino Toscano are a firm texture, intense flavor and a mildly peppery finish. Flavors become more savory and intense with age, while retaining an underlying sweetness and mellow quality. It can be either raw or pasteurized milk, but it is always made with milk from animals who graze or are fed hay or dried grasses. No silage is permitted. The cheese usually takes the form of a semi-flattened sphere. 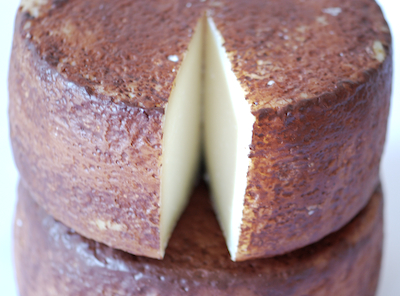 The outer rind is often ochre coloured, but there is considerable variability according to how the the cheese has been washed during maturation, generally with a combination of crushed tomatos, ash and/or olive oil. Fresh Pecorino Toscano is quite mild, and rather creamy, though it does have some nutty oak leaf overtones, with underlying savory and sweet flavors that intensify with age. With time Pecorino Toscano becomes firmer and sharper, though it never approaches the sharpness or the saltiness of pecorino Romano. Try pairing with olives, Italian cured meats, and with crisp white wines, or Italian wines from Chianti.